(iii) Questions Nos. 9 to 18 carry two marks each. Questions Nos. 19 to 27 carry three marks each and questions Nos. 28 to 30 carry five marks each. (iv) There is no overall choice. However, an internal choice has been provided in one question of two marks, one question of three marks and all three questions of five marks each. You have to attempt only one of the choices in such questions. (v) Use of calculators is not permitted. However, you may use log tables if necessary. A flexible wire of irregular shape, abcd, as shown in the figure, turns into a circular shape when placed in a region of magnetic field which is directed normal to the plane of the loop away from the reader. Predict the direction of the induced current in the wire. The wire is expanding to form a circle, which means that force is acting outwards on each part of the wire because of the magnetic field (acting in the downwards direction). The direction of the induced current should be such that it will produce magnetic field in upward direction (towards the reader). Hence, the force on the wire will be towards inward direction, i.e., induced current is flowing in anticlockwise direction in the loop from c-b-a-d-c.
Why must electrostatic field at the surface of a charged conductor be normal to the surface at every point? Give reason. Electric field is defined to be the gradient of potential and the surface of a conductor has a constant potential. Therefore, there is no field along the surface of the conductor and, hence, the electrostatic field at the surface of a charged conductor should be normal to the surface at every point. Define one tesla using the expression for the magnetic force acting on a particle of charge q moving with velocity v⃗ in a magnetic field B⃗ . One tesla is the defined as the magnitude of magnetic field which produces a force of 1 newton when a charge of 1 coulomb moves perpendicularly in the region of the magnetic field at a velocity of 1 m/s. In both β− and β+ decay processes, the mass number of a nucleus remains the same, whereas the atomic number Z increases by one in β− decay and decreases by one in β+ decay. Explain giving reason. ϒ-rays, microwaves, infrared rays and ultraviolet rays. The figure shows the field lines on a positive charge. Is the work done by the field in moving a small positive charge from Q to P positive or negative? Give reason. In photoelectric effect, why should the photoelectric current increase as the intensity of monochromatic radiation incident on a photosensitive surface is increased? Explain. A ray of light falls on a transparent sphere with centre C as shown in the figure. The ray emerges from the sphere parallel to the line AB. Find the angle of refraction at A if the refractive index of the material of the sphere is 3√. Two very small identical circular loops, (1) and (2), carrying equal currents I are placed vertically (with respect to the plane of the paper) with their geometrical axes perpendicular to each other as shown in the figure. Find the magnitude and direction of the net magnetic field produced at the point O. Show that the current leads the voltage in phase by π/2 in an AC circuit containing an ideal capacitor. Give two points to distinguish between a paramagnetic and a diamagnetic substance. Find the charge on the capacitor as shown in the circuit. Identify the equivalent gate represented by the circuit shown in the figure. Draw its logic symbol and write the truth table. Figure shows a ray of light passing through a prism. If the refracted ray QR is parallel to the base BC, show that (i) r1 = r2 = A/2 and (ii) angle of minimum deviation, Dm = 2i − A. Define the term modulation. Draw a block diagram of a simple modulator for obtaining AM signal. (a) How does oscillating charge produce electromagnetic waves? (b) Sketch a schematic diagram depicting oscillating electric and magnetic fields of an em wave propagating along + z-direction. Draw energy band diagrams of an n-type and p-type semiconductor at temperature T > 0 K. Mark the donor and acceptor energy levels with their energies. Distinguish between a metal and an insulator on the basis of energy band diagrams. In a series LCR circuit, obtain the conditions under which (i) the impedance of the circuit is minimum and (ii) watt-less current flows in the circuit. The currents flowing in the two coils of self-inductance L1 = 16 mH and L2 = 12 mH are increasing at the same rate. If the power supplied to the two coils are equal, find the ratio of (i) induced voltages, (ii) the currents and (iii) the energies stored in the two coils at a given instant. (a) A point charge (+Q) is kept in the vicinity of an uncharged conducting plate. Sketch the electric field lines between the charge and the plate. (b) Two infinitely large plane thin parallel sheets having surface charge densities σ1 and σ2 (σ1 > σ2) are shown in the figure. Write the magnitudes and directions of the net fields in the regions marked II and III. (a) Two long straight parallel conductors 'a' and 'b', carrying steady currents Ia and Ib are separated by a distance d. Write the magnitude and direction of the magnetic field produced by the conductor 'a' at the points along the conductor 'b'. If the currents are flowing in the same direction, what is the nature and magnitude of the force between the two conductors? 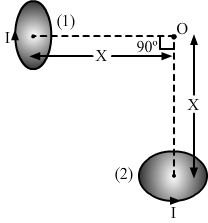 (b) Show with the help of a diagram how the force between the two conductors would change when the currents in them flow in the opposite directions. Describe briefly, by drawing suitable diagrams, the (i) sky wave and (ii) space wave modes of propagation. Mention the frequency range of the waves in these modes of propagation. (a) Describe briefly how the Davisson-Germer experiment demonstrated the wave nature of electrons. ​(b) An electron is accelerated from rest through a potential V. Obtain the expression for the de-Broglie wavelength associated with it. When Puja, a student of 10th class, watched her mother washing clothes in the open, she observed coloured soap bubbles and was curious to know why the soap bubbles appear coloured. In the evening when her father, an engineer by profession, came home, she asked him this question. Her father explained to her the basic phenomenon of physics due to which the soap bubbles appear coloured. (a) What according to you are the values displayed by Puja and her father? (b) State the phenomenon of light involved in the formation of coloured soap bubbles. (a) Why is zener diode fabricated by heavily doping both p- and n-sides of the junction? (b) Draw the circuit diagram of zener diode as a voltage regulator and briefly explains its working. (a) How is a photodiode fabricated? (b) Briefly explain its working. Draw its V - I characteristics for two different intensities of illumination. (i) Distinguish between unpolarised and linearly polarised light. (ii) What does a polaroid consist of? How does it produce a linearly polarised light? (iii) Explain briefly how sunlight is polarised by scattering through atmospheric particles. In a parallel plate capacitor with air between the plates, each plate has an area of 6 × 10−3 m2 and the separation between the plates is 3 mm. (i) Calculate the capacitance of the capacitor. (ii) If this capacitor is connected to 100 V supply, what would be the charge on each plate? (iii) How would charge on the plates be affected, if a 3 mm thick mica sheet of K = 6 is inserted between the plates while the voltage supply remains connected? (a) Using Bohr's postulates, derive the expression for the total energy of the electron in the stationary states of the hydrogen atom. (b) Using Rydberg formula, calculate the wavelengths of the spectral lines of the first member of the Lyman series and of the Balmer series. (a) Define the terms (i) half-life (T1/2) and (ii) average life (τ). Find out their relationships with the decay constant (λ). (b) A radioactive nucleus has a decay constant λ = 0.3465 (day)–1. How long would it take the nucleus to decay to 75% of its initial amount? (a) State the principle of a potentiometer. Define potential gradient. Obtain an expression for potential gradient in terms of resistivity of the potentiometer wire. (b) Figure shows a long potentiometer wire AB having a constant potential gradient. The null points for the two primary cells of emfs ε1 and ε2 connected in the manner shown are obtained at a distance of l1 = 120 cm and l2 = 300 cm from the end A. Determine (i) ε1/ε2 and (ii) position of null point for the cell ε1 only. (a) Define the term 'drift velocity' of charge carriers in a conductor. Obtain the expression for the current density in terms of relaxation time. (b) A 100 V battery is connected to the electric network as shown. If the power consumed in the 2 Ω resistor is 200 W, determine the power dissipated in the 5 Ω resistor. (a) Draw a labelled ray diagram of an astronomical telescope to show the image formation of a distant object. Write the main considerations required in selecting the objective and eyepiece lenses in order to have large magnifying power and high resolution of the telescope. (b) A compound microscope has an objective of focal length 1.25 cm and eyepiece of focal length 5 cm. A small object is kept at 2.5 cm from the objective. If the final image formed is at infinity, find the distance between the objective and the eyepiece. (a) Write three characteristic features to distinguish between the interference fringes in Young's double slit experiment and the diffraction pattern obtained due to a narrow single slit. (b) A parallel beam of light of wavelength 500 nm falls on a narrow slit and the resulting diffraction pattern is observed on a screen 1 m away. It is observed that the first minimum is a distance of 2.5 mm away from the centre. Find the width of the slit.